Flat Earth theory has enjoyed staying power since at least the 19th century despite being patently untrue. Neil deGrasse Tyson, the late Carl Sagan, Bill Nye the Science Guy, and other big thinkers will show you how to disprove this bad idea, all without having to take a journey into space. Whether born from contrarian trolling or earnest skeptic beliefs, the "is the earth really round?" debate rages on. Science luminaries—including Bill Nye, the late Carl Sagan, and Neil deGrasse Tyson—can easily debunk this myth. Maybe he's your conspiracy-loving uncle at Thanksgiving or that friend who will post anything on Facebook. Whatever the case, you imagine it'll be a quick conversation. You google some of the many, many, many awe-inspiring images that show a definitely spherical Earth from space. Easy breezy. "Ah, not so fast," the flat earther responds. "Neither of us has ever been to space, so you can't prove those images are authentic. Maybe they've been doctored as part of some deep state plot. Fake news, I say." You may be tempted to laugh off this portrayal as a strawman, but this is an actual argument made by the Flat Earth Society. According to its FAQs page, the society does not "lend much credibility to photographic evidence" as it "is too easily manipulated and altered." The same page also claims the most likely explanation for round-Earth propaganda is that space agencies are involved in a conspiracy, one that started during the Cold War's Space Race for political gain and continues today as a means of embezzlement. 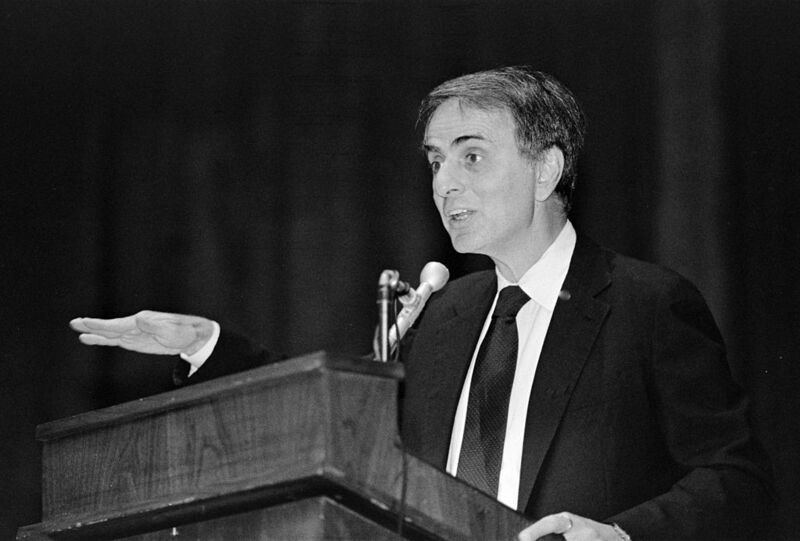 Carl Sagan, pictured, is definitely not making a hand gesture about what shape he thinks the planet is. In an episode of Cosmos, Carl Sagan demonstrated how Greek mathematician Eratosthenes of Cyrene debunked flat-Earth theories more than two millennia ago. Have a look. Eratosthenes's observations not only gave us proof of Earth's sphericity—furthering the insights of other Hellenistic thinkers such as Pythagoras and Aristotle—his calculations also gave us an incredibly accurate measurement of Earth's circumference. Today, we've improved upon that measurement, but only thanks to instruments slightly more advanced that a pillar and a well. The best part is that Sagan's model can be reproduced for your debate. All it takes is poster board, two sticks, and a sunny day. With model in hand, you can show how a curved Earth is required for commonplace phenomenon to be as they are. The flat Earth debate rages on with memes like this, creator anon. But your flat Earther remains unconvinced by Sagan's "arts-and-crafts project." He needs more evidence before changing his mind. In that case, consider the sinking ship effect. Here's how Michelle Thaller, assistant director for science communication at NASA, explained it to Big Think. You can push this experiment further. Have a friend stand on the shore while you get to higher ground. If you and your friend watch the same ship, you'll notice that you can see the ship's mast for longer than your friend. The higher your elevation, the more of the ship you can see. That's because your extra height allows you to see farther over the Earth's curvature. Are you currently landlocked? You can perform this height differential test on other objects sinking over the horizon. 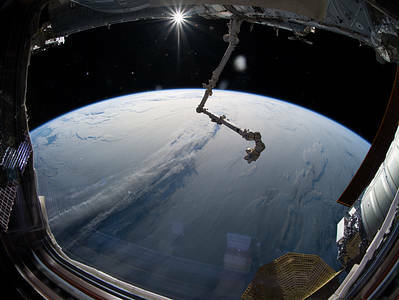 On a flat Earth, you would both see the object in full regardless of elevation, but higher observers always see more of the object thanks to their vantage point. During one of Big Think's Tuesdays with Bill, Bill Nye added another layer to the sinking ship effect: "If you live on the East Coast, figure out why you can't see Spain from the East Coast or North America? […] What's the problem there? Then climb a tower or go to the top of a hill or a mountain, and you'll see a little farther, but you will not see to the other side of the Earth, places we know exist." As Bill Nye suggests, if the Earth were flat one should be able to use a high-powered telescope to view Europe from the East Coast. Flat earthers could claim victory by setting up this experiment. But no flat Earther has ever done so, because Earth's sphericity hides Europe and North America from each other. Is the debate worth the effort? There are many, many more ways to determine the Earth is a sphere without a trip to space. There's the fact that Earth's shadow is always round during a lunar eclipse. There are the varying star constellations and the existence of time zones. Do we really need to bring up airplanes never discovering a global drop off? Hellenistic thinkers discovered many of these reasons more than 2,000 years ago, yet flat Earthers have stubbornly soldiered on. Some have done so out of devotion to literal interpretations of religious texts, while others, like the aforementioned Flat Earth Society, simply believe that someone, somewhere is hiding something. 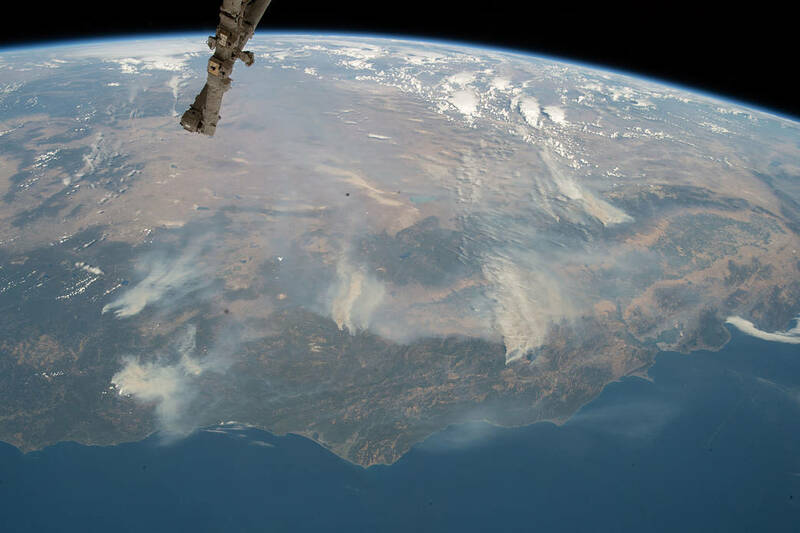 Live Science traces modern flat-Earth theories to Samuel Rowbotham and his alternative to the scientific method, the "Zetetic Method." In the mid-19th century, Rowbotham used Zetetic Astronomy to contend that the Earth was flat, the stars circled above us, and a wall of ice keeps the oceans from pouring over the edge. Flat Earthers continue to cite his work to this day. Give this history, if your flat Earther is a true believer, it is unlikely that any of our explanations will change his mind. So maybe the question, how to win a debate with a flat Earther? isn't the one we should ask. Maybe we should be asking, should we debate them in the first place? Astronaut Chris Hadfield doesn't think it is worth the effort. He worries that debating flat Earthers gives them an air of credibility they don't deserve. "If somebody says the world is flat, it's patently untrue, so there's no point in engaging in conversation," Hadfield says. "[…]If someone has chosen to take the facts and be deliberately stupid about them then I think they've discounted themselves from rational conversation, so I don't bother." Alfred Russel Wallace learned just how irrational such conversations can be. In 1870, he saw an announcement offering 500 pounds to anyone who could prove the Earth was round. He created a wonderfully simple experiment and did just that. John Hampden, the flat Earther offering up the prize, refused to pay and instead pursued an incessant campaign of harassment against Wallace that lasted 21 years. On the other hand, if bad ideas infect the heads of influential people, they can spread with viral efficiency. As reported by NPR, many middle school teachers had to reteach the Earth's sphericity after NBA star Kyrie Irving espoused his belief in a flat Earth. Even then, many students continued to believe their teachers were a part of the round-Earther conspiracy. NEW YORK, NY - JUNE 20: Astrophysicist Neil deGrasse Tyson attends the IMAX exclusive experience for Jurassic World: Fallen Kingdom at AMC Loews Lincoln Square IMAX on June 20, 2018 in New York City. The only cure against bad ideas, one could argue, is to develop herd immunity through open debate and good facts. This seems to have been the impetuous for Neil DeGrasse Tyson to debate rapper B.o.B. over Twitter. "For me, the fact that there is a rise of flat Earthers is evidence of two things," Tyson says. "One, we live in a country that protects free speech. And two, we live in a country with a failed educational system. Our system needs to train you not only what to know but how to think about information and knowledge and evidence. If you don't have that kind of training, you'll run around and believe anything." Both arguments have their merits, and whether you choose to engage in debate or not is ultimately your choice. Should you choose to enter that fray, at least you'll have thinkers like Bill Nye, Neil DeGrasse Tyson, Michelle Thaller, and, of course, Carl Sagan in your corner.